Home to nomadic tribes for centuries, Kyrgyzstan’s culture changed during the years of Soviet occupation as thousands of Slavic farmers migrated to the region. The country gained independence from the Soviet Union in 1991. Since then, Kyrgyzstan has struggled with corrupt political leadership and conflict. Kyrgyzstan borders China, Kazakhstan, uzbekistan and Tajikistan. Kyrgyzstan is home to 5.4 million people. The country includes 76,641 square miles of land. Kyrgz and Russian are the official languages. The life expectancy in Kyrgyzstan is 68 years. Visit National Geographic to learn more about Kyrgyzstan. Question: What are the main industries in Kyrgyzstan? 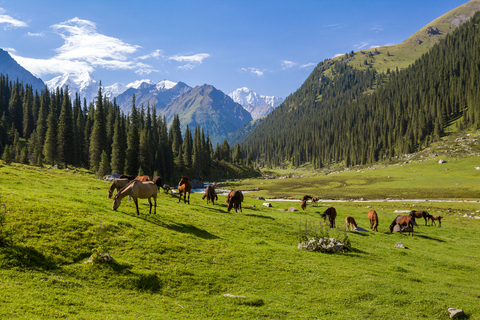 Answer: Many farmers raise livestock, including yaks, horses, cattle and sheep. The country has some natural gas and oil reserves. Declan, Tobin. " Fun Kyrgyzstan facts for kids ." Easy Science for Kids, Apr 2019. Web. 26 Apr 2019. < https://easyscienceforkids.com/kyrgyzstan/ >.